I guess it had to happen one day. . . !? 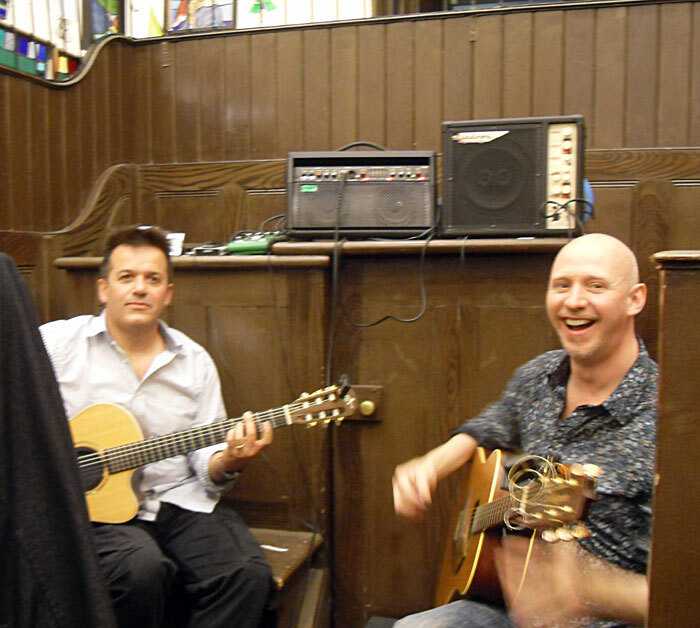 All joking aside, Gerald and I did a fantastic little duo gig yesterday evening, playing for a friend’s private art view. 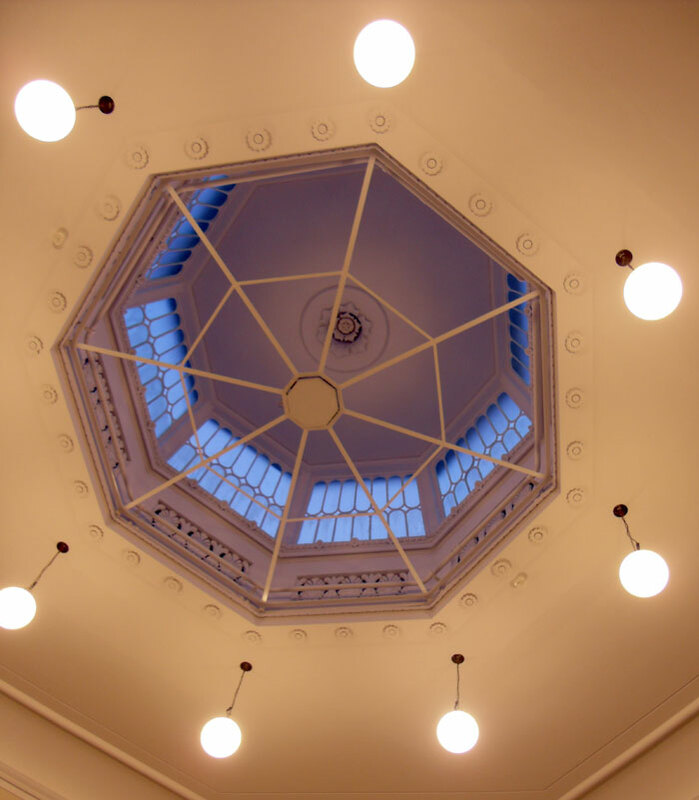 Part of the 2009 HVAF Open Studios, the show featured a collection of several artists’ work, and took place in the amazing old courthouse in St Albans (situated on the ground floor of the Town Hall building). Unfortunately, the only space available for us to sit and play was within the dock itself! Accessible only through a tiny door (presumably to stop convicts from escaping too easily? 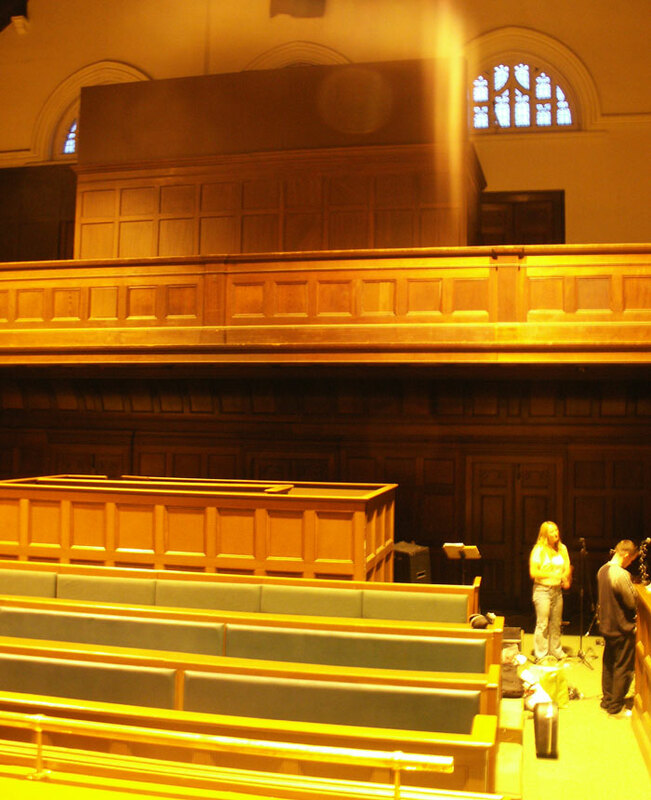 ), it was rather odd to play to a ‘audience’ whilst sitting in a low, enclosed pulpit-affair, literally separated from everyone by bars! Here are a few shots taken my my friend SI – all-in-all a great fun evening! 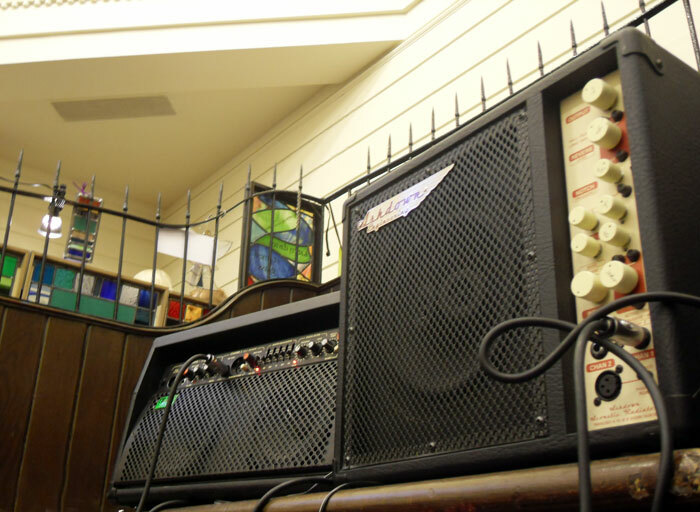 We were only providing some very ambient / background music for the punters, but it seemed very well attended and there was some great art on show. The exhibition is called ‘Art Symphony’ and is open in two day blocks – 30th Sept / 1st Oct and 3 / 4 October. Gerald and myself, firmly behind bars! Life is a strange thing…! On Sunday just gone, the Roberts, Batkin, Andrews Collective performed their third gig, this time in front of the old Clocktower in St Albans city centre. Thanks to all the loyal friends that came to support us – here’s to lots more gigs in the months to come! Me looking really miserable on BBC2! and 45.38 (ish) for a few seconds of the soul band! 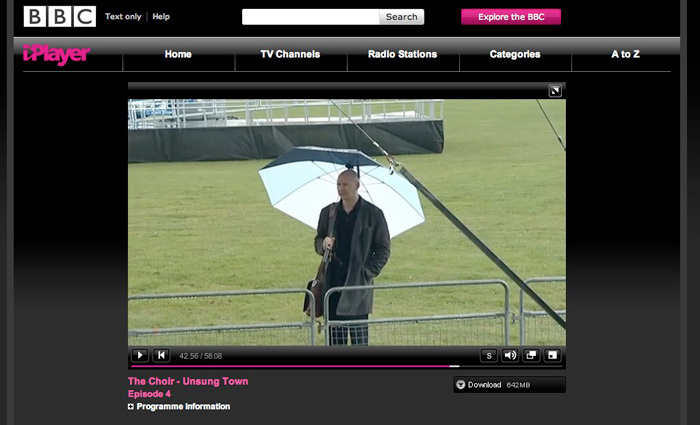 I’ve just seen an episode of the BBC2 reality TV series ‘The Choir’, which this week features a two second burst of me standing in the rain whilst waiting to play with the soul band at a mini-festival organised by the BBC and featuring The Choir cast. I have to say I look incredibly miserable, fed up and even a little fat!! Try 42.54 (ish – 2 seconds of me looking really miserable in the rain!!) and 45.38 (ish) for a few seconds of the soul band! Steampunk-style dials, gauges and doodads! As part of a city-wide day of activities that happened this Sunday in St Albans, certain buildings and attractions not normally open to the public opened their doors to visitors. One of these was the old St Albans South Signal Box, situated alongside Platform 4 of the existing station and now fabulously restored by a dedicated bunch of volunteers. 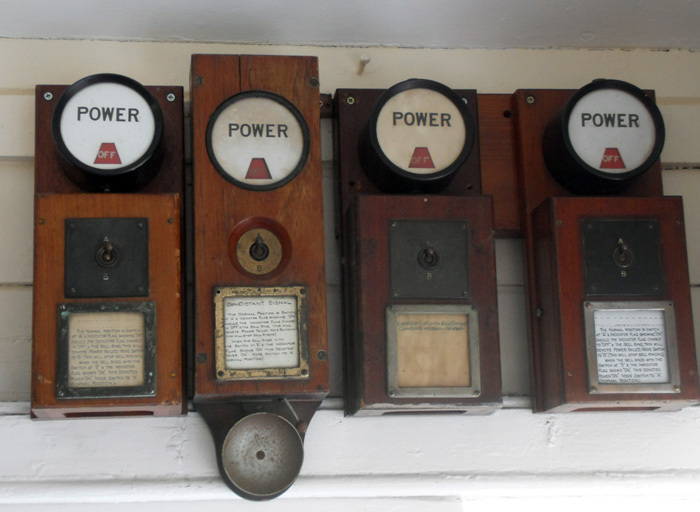 Not only is it a wonderful example of that era of train travel, it’s absolutely packed with original bell boxes, power gauges, telephones and associated equipment of the period – all of which have a brassy ‘steampunk’ look to them. 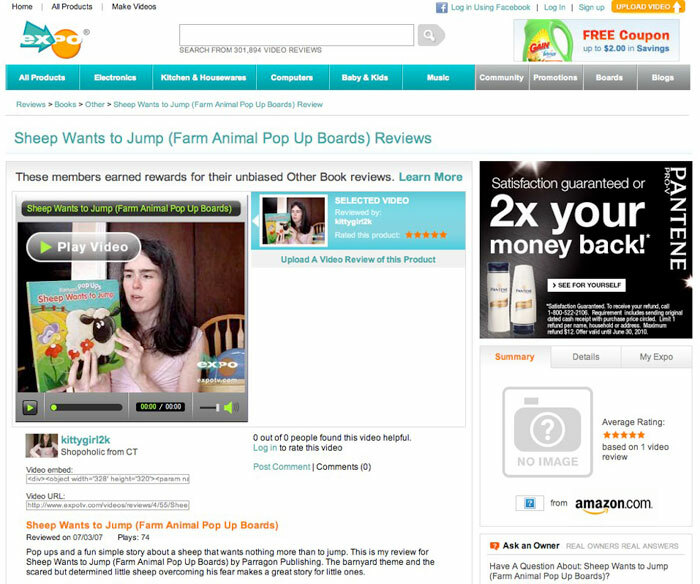 I was amazed the other day when my friend CCBB showed me a video on Expotv.com of a lady reviewing one of my old books for children. I wrote quite a few of these type of books a few years ago (some more complex than the one reviewed here, some less so etc) – I really enjoyed doing them at the time, but at some point the commissions just seemed much harder to come by. . . Hey Ho! I find that copies of them crop up here and there all the time, however (Book Crossing sites, junk shops, the bargain-bin at Asda, that sort of place!) so it’s always quite fun when I catch a reference to / glimse of them! 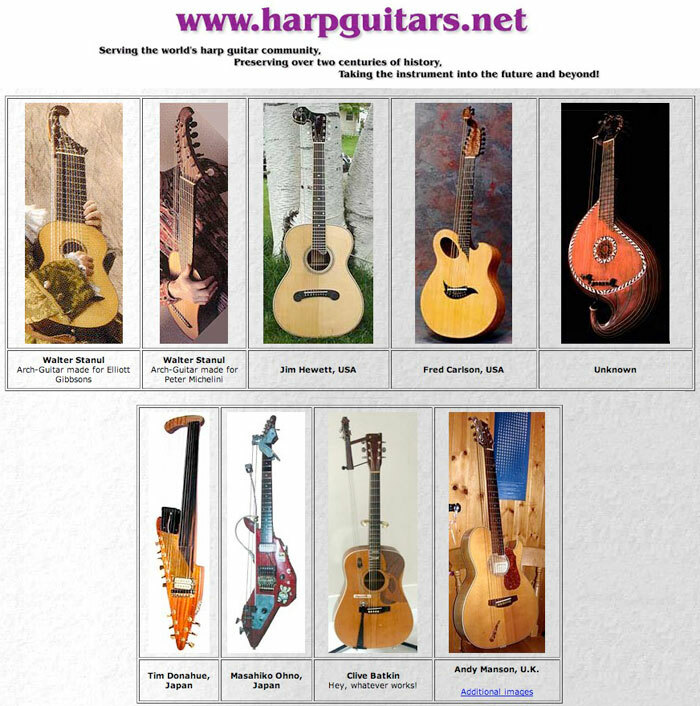 I’ve just seen that my Guiharpitar has made it on to Harp Guitar.net, one of the premier Harp guitar websites. It’s a wonderful site, full of fascinating photos and information on these bizarre and unusual instruments. Mine is shown on the bottom of the ‘Organology’ page , which is a bit tricky to find – visit it here . I particularly liked their comment on my creation (‘Hey, whatever works!’), which I feel just about sums up everything I do!? Shed Night makes it to ReadersShed! 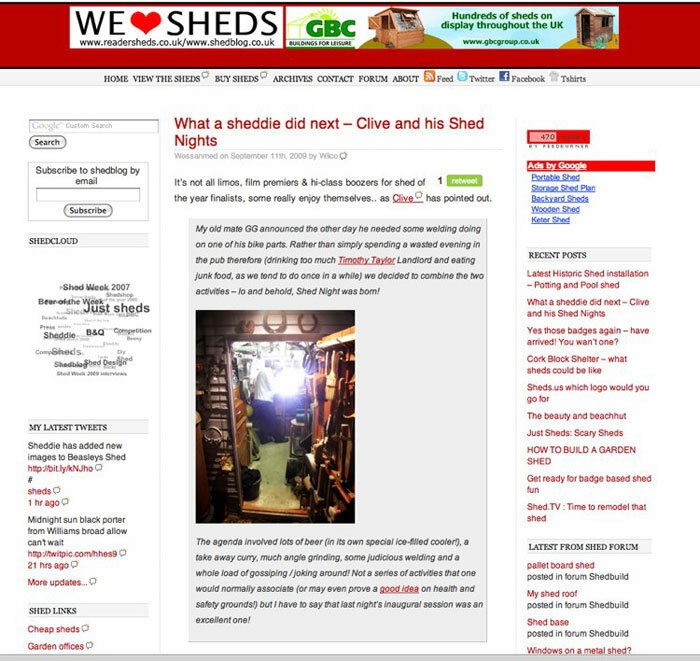 Uncle Wilko of ReadersSheds was kind enough to add a little bit about my Shed Night post on his excellent blog about sheds – read it here. . .